Residence Inn by Marriott Loveland promises guests and locals great holiday shopping in Loveland this holiday season. Located just steps away from the Outlets at Loveland and across I-25 from the Shops at Centerra, guests can’t get any closer to the best shopping the town has to offer. The Shops at Centerra offers guests and locals great events, including the opening of the Ice Rink and horse-drawn carriage rides, along with over 75 shopping, dining and entertainment offerings. The Outlets at Loveland offer guests over 35 shopping outlets. Combined, both Loveland shopping centers welcome guests to experience what Loveland has to offer this Holiday Season. For more information, please visit http://www.outletsatloveland.com/directory/ or http://www.thepromenadeshopsatcenterra.com/. Residence Inn by Marriott Loveland is the ideal home-away-from-home with comfortable guestrooms, great amenities and a convenient location for business and leisure travelers. All guestrooms include HDTV, fully-equipped kitchens, comfortable beds and much more. Accessible guestrooms are available upon request. Hotel amenities feature: free hot buffet breakfast daily, complimentary Wi-Fi, on-site laundry, sports court, pool and much more. Residence Inn by Marriott Loveland is located near I-25 and Hwy 34- within walking distance of the Outlets at Loveland and across I-25 from the Shops at Centerra. For reservations and more information on the Residence Inn by Marriott Loveland hotel, please visit http://www.residenceinnloveland.com or call (970) 622-7000. 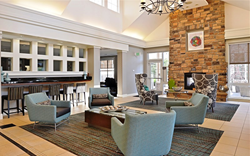 Residence Inn by Marriott Loveland is proudly managed by Stonebridge Companies in Denver, Colo. Founded in 1991 by Navin C. Dimond, Stonebridge Companies is a privately owned, innovative hotel owner, operator and developer headquartered near Denver. The diverse listing of properties includes select-service, extended-stay, mid-scale and full-service hotels in markets throughout the U.S. For detailed information, visit our website at http://www.sbcos.com.